A Lochaber community is being urged to log every near miss at a school crossing on a busy trunk road after Transport Scotland rejected its plea for a pelican crossing. Fears were raised that someone could be killed or seriously injured if the junction between the A830 Fort William to Mallaig road and the minor road to Banavie Primary School was not improved. Locals pointed out that many of the 150 children arriving at and leaving the school had to cross the busy Road to the Isles and they called for the installation of a crossing with traffic lights operated by pedestrians. 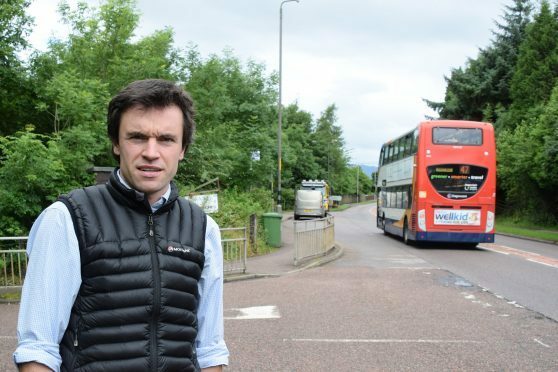 Transport Scotland and Bear Scotland representatives met members of the community, police, and Highland Council in the summer to discuss the situation and said they would consider the feedback from the meeting. However, Councillor Ben Thompson, Caol and Mallaig, said they have now been told that the trunk road agency did not consider the location suitable for a pelican crossing because there were not enough people crossing at this point out with school times. He said: “Part of the problem is the number of children who are dropped off by car because parents do not consider it safe for them to walk to school. Mr Thompson added that he had received several reports of near misses while the children were crossing the road, one involving the school crossing patroller almost being knocked down while the 20mph signs were not working. “I think there is an obvious need for the crossing without having to record all the near misses. “However, if we can show them there is a problem, then we might win the battle that way. “My impression is that Transport Scotland is quite data driven, so recording near misses is talking their language,” said the councillor. And he encouraged anyone who saw a near miss at the school crossing to keep a record of it. A Transport Scotland spokeswoman said: “We want to narrow the road at the existing crossing patroller crossing to reduce vehicle speeds and the time it takes to cross from one side of the road to the other. “This will make it easier and safer for those wishing to cross.